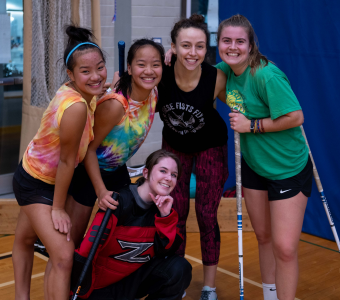 Event Description: With a mix of floor and field hockey and a twist of lacrosse, this new tournament is an excellent chance to have some fun in an emerging sport. Grab some friends and enjoy this 3 on 3 tournament and shoot your way to a championship shirt. 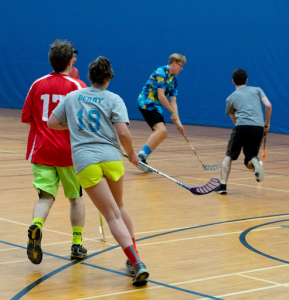 The first ten minutes of your 2-hour time slot is structured as a learn-to-play as there are significant differences between floorball and traditional hockey, followed by 3 games of round robin play, followed by playoffs. Who Can Participate: This Intramural Event is open to UBC Students. Participation Structure: Floorball Championship offers only competitive team options, and offers only the Open category, which welcomes all individuals to participate regardless of gender (Men, Women, Two-Spirit, Trans, Gender Non-Conforming). Teams can be of 6-8 people. Event: 5pm - 11pm, Fri Nov 2nd, 2018. Please arrive 20 mins before your game time. 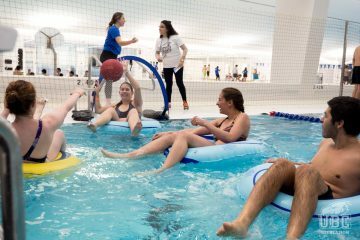 At UBC Recreation we aspire to include everyone in our programs and facilities. But you may have questions or concerns about if this event is right for you. If you have any questions or concerns please feel free to contact our event team at im.events6@ubc.ca. or call 604-822-6000. One of our great-spirited capsize victims at Day of the LongBoat 2018. An ocean dip didn’t stop them from finishing their race! Term 1 has absolutely raced by- time to recap on a busy semester! Spot yourself in our event photo albums on Facebook! 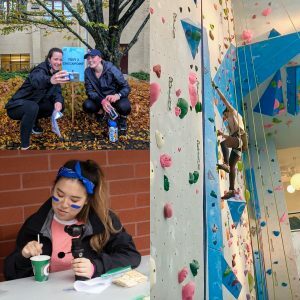 From UBC’s biggest Day of the Longboat EVER, to some of the most creative team names this campus has seen, thank you to all of our participants for keeping the semester fun- we can’t wait to catch you in January for Gladiator, Curling Bonspiel and you guessed it- Storm the Wall! 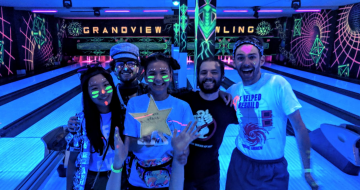 This year our teams hit up Grandview Lanes for the ultimate glow-in-the-dark, bowling extravaganza. Our space-themed event brought together martians and space alien hunters alike. Teams bowled their hearts out, winning with strikes and some good laughs with a gutterball (or two). Our teams braved the rain in their Hawaiian shirts and baseball hats at this year’s Fall Softball Classic! This year saw some 10/10 home runs and some great team spirit. Thank you to all our participants for coming out to this adeptly-themed Tropical softball tournament! Deep in the woods of Pacific Spirit Park, we gathered in fine Fall fashion. The sun shone down as individuals and relay teams waited at the start line. There were multiple races for multiple levels of running enthusiasts. The best part? Quite possibly the delicious treats at the finish line! UBC’s first ever Amazing Chase kicked off with a race against the clock, with each team scrambling to solve a list of riddles for the Tier 3 challenges. All our teams moved on to Tier 2 with record time, taking on the Aviary, the infamous ‘Shadow’ and other tests of fortitude and skill. This brand-new event introduced popular European sport floorball- a combination of ball hockey and field hockey- to teams of 4+ students. Wearing matching tie-dye shirts and classic scrunchies, the teams rocked the retro theme and picked up the sport quickly. The epic round-robin tournament ended with fast-paced playoffs, and we can’t decide if it was more fun to play – or to watch the action! Thanks to all our participants for rockin’ some neon socks and being such good team players! Team Highlight: Our amazing all-women team- TwentyFloor Seven! We kicked off this year’s Tennis Smash tournament with a Wimbledon theme. All of our participants were ready at the door to show off their best Serena Willams-esque serve! 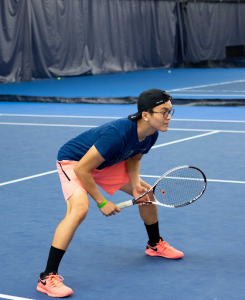 The participants circulated a variety of different stations to test their skills and prove that they were deserving of the ultimate prize, the bragging rights of being crowned the Tennis Smash Tournament champion! Thanks to all of our participants for coming out and showing us a smashing good time! This year marked the 31st Day of the LongBoat and our BIGGEST to date, with 380 teams hitting the water over the weekend, kicking off with a VIP- UBC’s very own President, Santa Ono! We loved seeing your Canada-themed gear- from flags to flannel- and the fantastic spirit of some of our capsize victims! 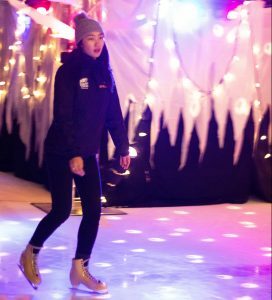 In a magical winter wonderland, this year’s Lace Up for Kids raised a total of _____ for the BC Children’s Hospital Foundation and the Rare Disease Foundation! Attendees were treated to some laughs courtesy of UBC Improv and saw featured performances by the UBC Figure Skating Club, the UBC Thunderbirds Dance Club and the UBC Dance team. Our skaters took to the ice with along with our One-of-a-Kind-Kid, Alina Schofield, who is battles congenital asplenia and a rare condition called VACTERL. Thank you to all the Residence groups, families and Palooza fundraisers for teaming up to help transform the world of rare disease care. Who had a WHALE of a time at this year’s Water Wars? We sure did! We watched our participants seas the day and it was fintastic seeing all the competitive spirit! A big shoutout to everyone who came to Water Wars 2018! We hope you got wet, sharky, and had a salty, but sweet time! Sea y’all next year! Thank you for joining us for all this First Semester Fun! Stay tuned by liking us on Facebook and following us on Instagram. See you in the New Year! What is the European sport of Floorball? 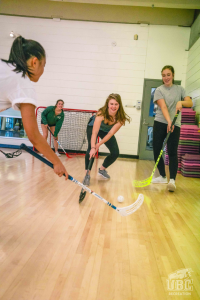 If you said, “a 5-on-5 sport similar to ball hockey but with different sticks and a whiffle ball”, you nailed it and are officially invited to UBC Recreation Intramurals’ new tournament Floorball Championship! If you said anything else… don’t worry, you’re definitely still invited. Traditionally, it’s a 5-on-5 game, but we’ll be taking our own spin on it and making it a 3-on-3 tournament. That means you’ll need yourself and AT LEAST 3 friends (3 players and a goalie! ), but it’s a fast-paced game and you’ll want to recruit some extra friends for substitutes. We recommend having around 7 players, so you all get to play! Make a team roster with your floor, with your faculty buddies, with your Intramurals team, or with some friends. Or, hey, you could always shoot your shot (see what we did there?) and ask that cutie in your advanced Plant Sciences class. So, what can you expect from Floorball Championship? Think indoor ball hockey played using slightly shorter sticks. The ball is basically a whiffle ball. It’s easy to pick up, and you’ll even get a 10 minute learn-to-play before the tournament! Post-tutorial, you’re off to the races with 3 games round-robin style, which are about 20 minutes each. That’s when it gets real… there’s playoffs and finals at the end of your time slot, and you know what that means. It’s champ shirt time, and you know you’ve always wanted one/need another one for your collection. Floorball Championship is going down on Friday, November 2nd with your choice of time slot: 5-7pm, 7-9pm, or 9-11pm. We’ll see you there, wearing athletic clothes and shoes, with your student ID in hand. No need for any equipment, we have you covered. Bring your team spirit, and get ready for an epic competition… and the possibility of a 2018 champ shirt?